On the water... in the heart of Vancouver! The Granville Island Hotel is an Island retreat in the heart of the action, but not overwhelmed by it. Easy to get to, but hard to leave, The Granville Island Hotel is ideally located for business travelers, vacationing families and couples on a romantic getaway. We invite you to stay with us and discover Vancouver's best kept secret! At the BEST WESTERN PLUS Chateau Granville Hotel & Suites & Conference Centre we know how hard it is to leave your furry friend(s) behind when travelling, so we are delighted to welcome your pooch(s) at the hotel. Conveniently located in downtown Vancouver, we are perfectly situated for you and your dog to enjoy the best that the city has to offer. An off-leash dog park is located just behind the hotel, while the local beach where your pet can enjoy a morning swim is located just 10 minutes away. Pets: We are pleased to offer the following for an ideal stay at this Vancouver pet- friendly hotel. - A designated pet friendly floor with 9 spacious suites to accommodate you and your pet. - A welcome gift bag with home-made dog biscuits, waste bags and an informational guide for local dog parks, attractions and services. - Dog beds and bowls available upon request. - A daily rate of $20 per night is applied. We allow dogs only. Up to 2 dogs per room with an 80 pound weight limit. - As we have limited designated rooms, please contact the hotel directly. Explore the Abercorn Inn Vancouver Airport, a Richmond hotel offering superior amenities, and everything you need for a great stay. Our facility has been renovated and features guest rooms with unique touches like diamond-paned windows, chintz draperies, old prints on the walls, and wood interiors. Other inviting amenities include free Wi-Fi, 32-inch flat screen television, and a well-equipped exercise facility. 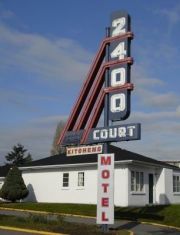 Classic and historic 65 unit motor court motel just east of Nanaimo St. on Kingsway in Vancouver, where guests can park for free practically in front of their unit. Convenient access to Grandview Hwy (with access to Hwy#1). This page features pet-friendly hotels & accommodation in Vancouver, British Columbia. Browse our site to find more 'pets allowed' and dog-friendly British Columbia accommodations, including motels, cottages, resorts, inns, B&Bs, vacation homes, and more... even dog parks and beaches in British Columbia! You can also check out pet and dog-friendly attractions, activities, and places in British Columbia.